Welcome! We are so excited for you to spend time with us! Our nursery provides care for infants and children through 3 years of age on Sunday mornings during the 8:30, 9:45, and 11:00 AM worship services. Nursery/Childcare is available in the Nursery and Toddler Rooms in the children’s wing of the Sanctuary building. Surrounded by stained glass and accompanied by the music of the pipe organ, you are invited to experience the presence of God in traditional worship with classic hymns, engaging liturgy, passionate solos and an inspiring message. Celebrate Holy Communion on the first Sundays of each month. Some wear “Sunday best” with suits, ties or dresses, but many come in jeans or what is most comfortable to them. Gather to worship with us this Sunday! Natural light and warm community enhance the modern worship experienced in the Community Life Center. Contemporary worship includes praise hymns both old and new, an engaging message, a teaching moment designed specifically for children and the celebration of Holy Communion on the first Sunday of every month. Come as you are and experience the presence of God who transforms us with love, forgiveness and grace! 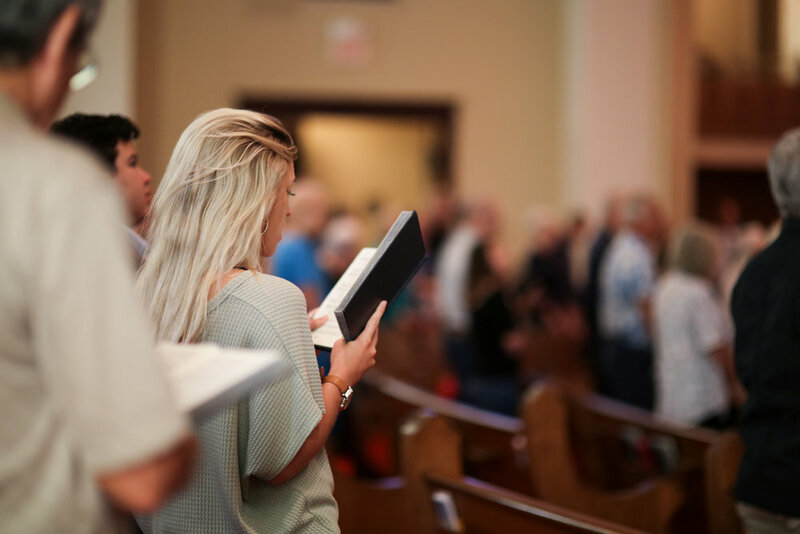 At First United Methodist Church, we offer two traditional worship services at 8:30 and 11:00 AM in the Sanctuary, and a contemporary worship service in the Community Life Center at 9:45 AM. Children’s worship bags are available at all three services on the colorful children’s table in the back of the Sanctuary and Community Life Center. A special Children’s Moment is held weekly during the 9:45 AM worship service. We believe that children are welcome at all worship services. In order to encourage families to worship together, we have moved many Sunday School classes to 11:00 AM to allow families to attend either the 8:30 or 9:45 AM worship services before going to Sunday School. Our nursery provides care for newborn children through 2 years of age on Sunday mornings for each hour of worship. We offer a welcoming, nurturing, and safe place for your children. We want you and your children to feel welcome and loved while learning of God’s love.